A great event deserves a great hotel rate! Spikefest is proud to have partnered with one of the nation’s leading hotel portals to give you one-stop shopping for the best hotel rates near the event and around the world. 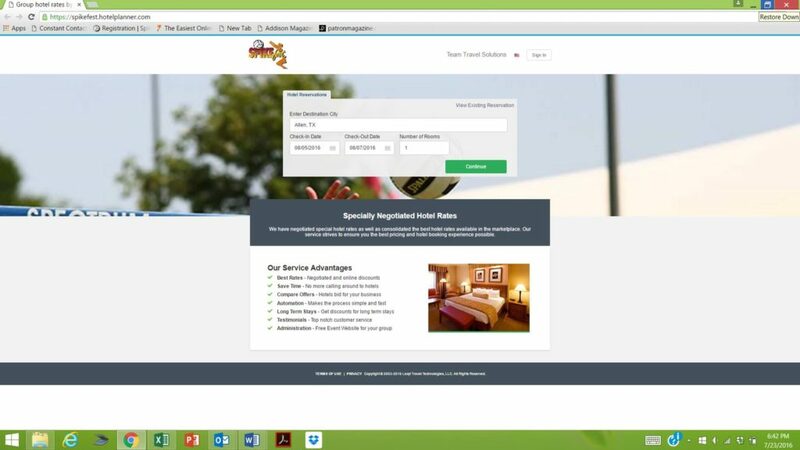 spikefest2018.hotelplanner.com/ That’s right, the technology pulls all the best rates and displays them in one spot for you. You can filter based on rate, star ratings, guest ratings, distance from event, etc.! At the time of this writing, we found several hotels under $65/ night within 8 miles of the event site! There are other hotels within a mile of the event site. 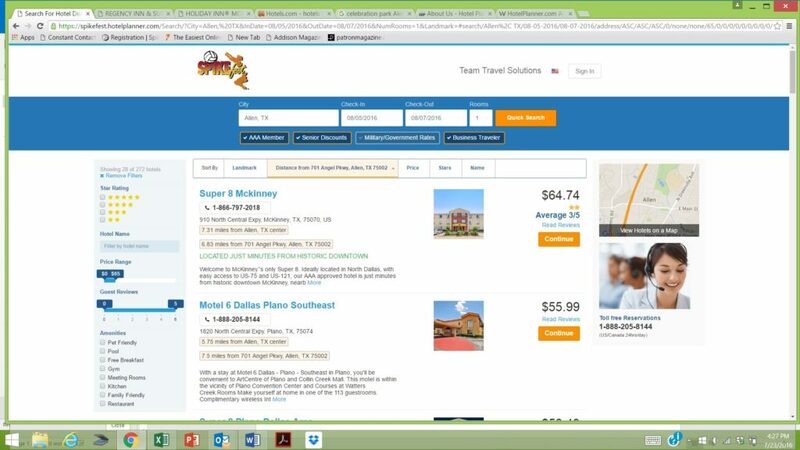 The rate and distance tools give you all you need to find the right hotel at the right price for you and your posse! Once you chose your city and dates the next screen will show results! To find out what choices are closest to the event site, just place the Spikefest venue address (701 Angel Pkwy, Allen, TX 75002) in the “Distance From” field, use the rate range tool on the left and boom, there you go — best deals custom for you! Any questions, you can call the toll free number on the right side of the screen for help in securing you best option…. Now, that is service! Just click here. Our partner also provides hotel services for heavyweight sports teams, university, corporate, and government organizations. The company’s other sports clients most notably include Match Room Sport, the San Diego Chargers, Washington Redskins, St. Louis Rams, Professional Bowlers Association, European Professional Golfers (EuroPro), Super League (Rugby), AFC Wimbledon, Millwall F.C., and Queens Park Rangers F.C. With this piece not in place, there is no excuse not to travel from the farthest reaches to come play in the largest, amateur 3-on-3 and 5-on-5, outdoor volleyball event in the country! Don’t miss your chance to play in this year’s event as Spikefest celebrates its 27th birthday August 6 & 7 in Allen, Texas! The event is full of great volleyball for all levels of competition and features music, food, contests, and more. Spikefest is an ideal opportunity for the whole family to come out and enjoy the festival atmosphere while taking in some of the best volleyball playing and watching on the planet.